Create advertisement packages based time, impressions or clicks (CPM, CPC or Time). Flat Rate - A package based on time: days, weeks, months or years. Cost Per Click (CPC) - The cost an advertiser pays to a site each time a visitor clicks on the advertiser's ad. Cost Per 1000 Impressions (CPM) - The price paid by an advertiser for a web site to display their banner ad a thousand times. Each time the banner is shown counts as one impression. Charge an appropriate amount for each zone location by choosing which zones will be included in each package. You can either select specific zones for each package or include all available zones. 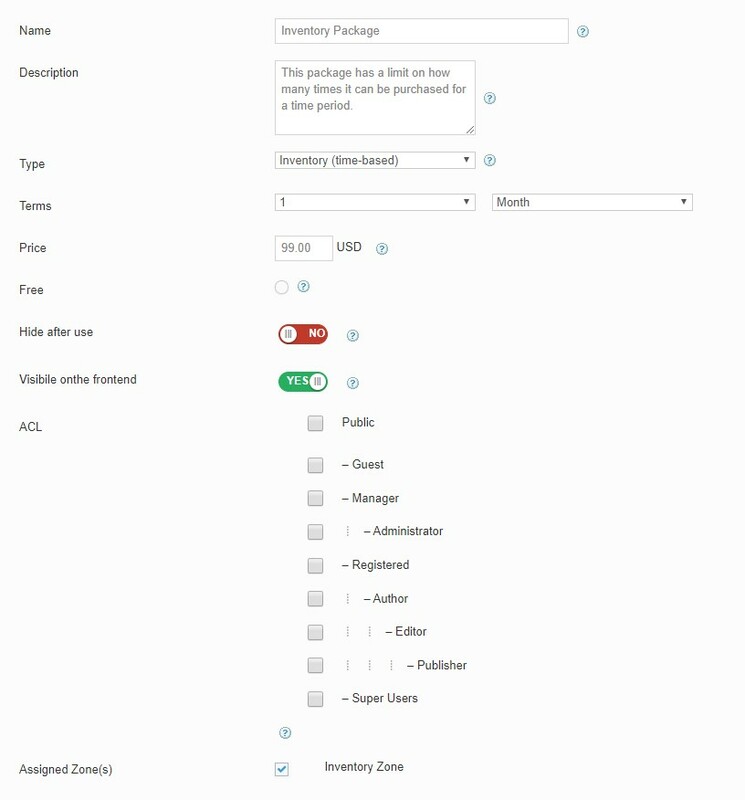 You can also use the Preview Zones function to let your advertisers see exactly which zones are available for each package. By clicking "View Zones" on your packages list, advertisers will be able to see your site's layout with each zone highlighted in a yellow background. Your advertisers will know exactly what they're buying and and it's all automatic. 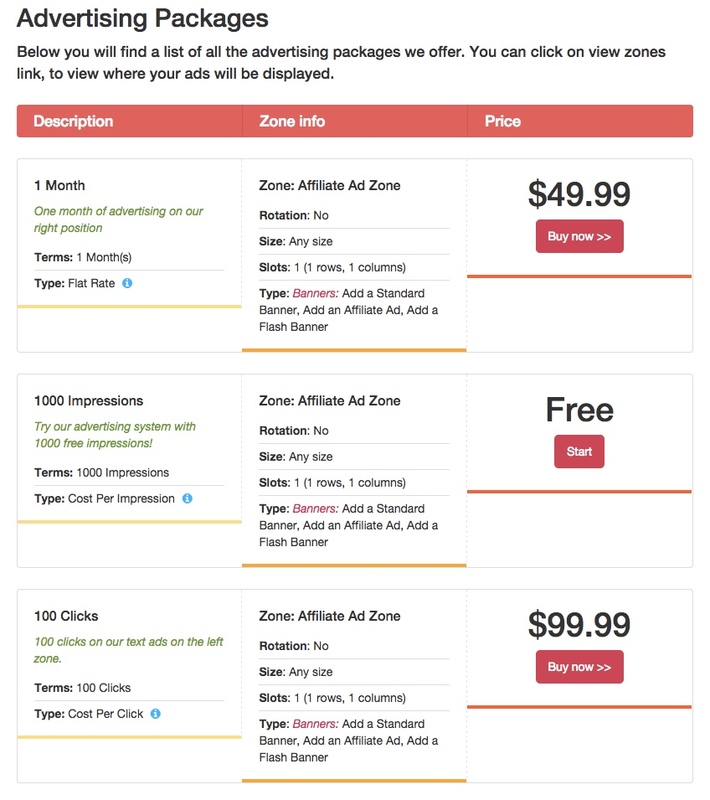 You can even give advertisers a free trial by setting a package as free. Advertisers will see the price marked as "Free" and an "Add" button instead of a "Buy" button. You can give them 500 impressions or five clicks and tempt them to come back for bigger packages. If you want to give your advertisers a taste of your advertising opportunities, you can create a free package. You can also choose to hide the free package after it has been used so advertisers can't take advantage of the free ad package again. Sometimes you need to create a package that only you or your team can see. If that's the case, then you can choose to hide the package on the front-end. A good example is if you want to display your own banners on an ongoing basis. You can create a package for up to 100 years and create a campaign based on your own needs. Since you don't want to sell this package to advertisers, you can hide it from them.